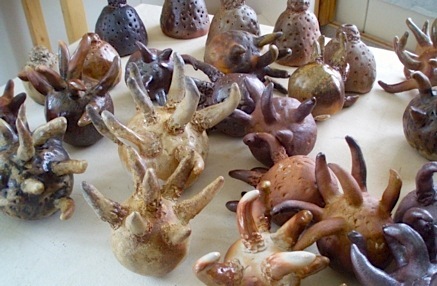 I’ve been busy the past few weeks creating a collection of creatures (affectionately named Uncultured Enigmas) that were wood-fired (to vitrification, approximately Cone 12) in Alan Lacovetsky’s great kiln (near Oak Hammock Marsh). I’ve participated in a half dozen collective firings with Alan, Dave Krindle, and friends over the past year… 48 hours of non-stop wood-stoking (we each take a 6 to 8-hour shift). Besides providing surprising results (opening the kiln is a bit like Christmas, as you never know just what you will get) wood firings are a great source of fellowship and camaraderie, tiring yes, but also addictive. 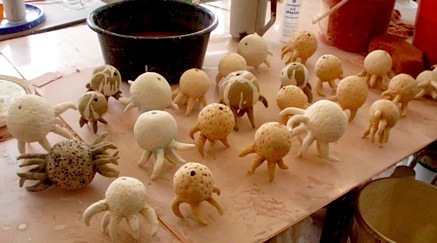 Images: Bisqued (pre-fired) Enigmas waiting to be stacked in the kiln; the “little beauties” back in my own studio.